That was rather stupid on their part, I hope they get their azzes handed to them. The short of it will be that I will no longer be nice and courteous and obliging to to any of them. All they get from me is what I am legally obligated to give them. I'm still considering filing a complaint of hunter harassment against them. Looks to me like you're trying to kill them all! We also got harassed by three greenhorn GW's for in excess of two hours after taking out. Could you provide a few more general details as to what LE was 'harrasing' you about? It appears we are experiencing max enforcement of F&G laws out here in Cali for whatever reason. Some feel it is a financial move to raise funds from fines. LE is 100% legit with their moves, but many hunters who are not used to max enforcement are getting cited for things they didn't used to, such as possession violations, daily bag violations, etc. But then, as Phil Robertson once said, "A duck hunt done turned into a deer hunt." Some feel it is a financial move to raise funds from fines. This was my theory as well. There were three of them and they had one borrowed pair of waders that didn't fit either of the three bears. I'll convey the full story later when I have more time. A better shot of my Canvasback from the other day (last year). We saw some more today, but no good shots on them. trying again tomorrow. And today's band from a hen ringneck. This is the first banded diver I've ever shot. We saw you pulling in this afternoon. How did it go at the coast? 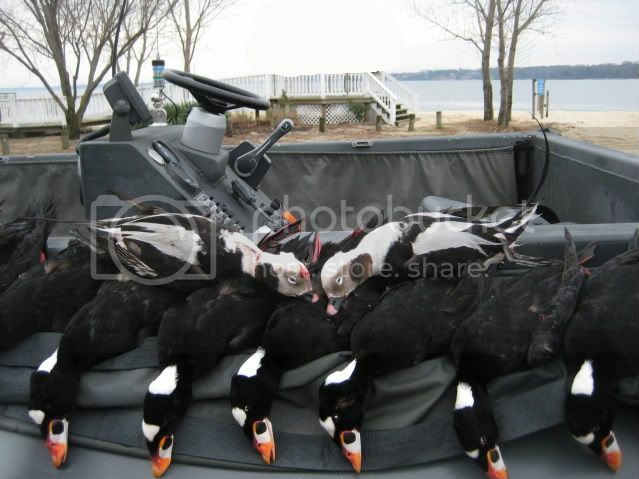 It was not the best of days but we scratched out a 4 man limit of Scoter with 2 nice bonus drake Oldsquaws. 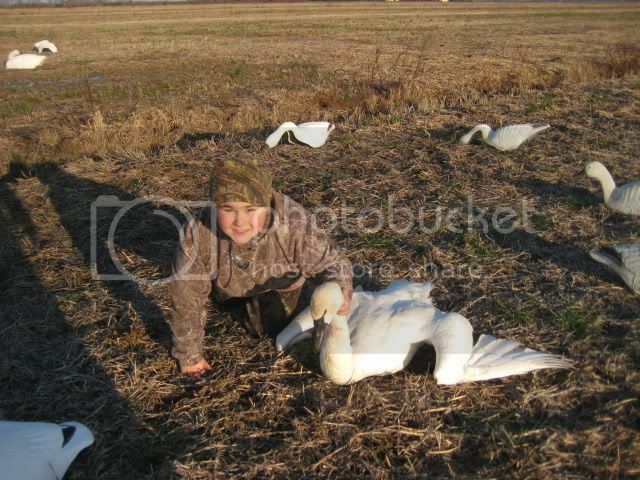 We hooked up with Chad today and shot some Swans. For a second there, I thought you had Mini Me with you. Jackson looks like he's got the fever. Our day was spent in the poor execution of a good plan. We brushed up Sean's boat with cedars and restrung all of our diver blocks with 15' of line. The plan was to make a portable open water rig. Unfortunately, the 25-40 mph winds made it impossible to anchor up anywhere in the open and we spent most of the day sailing the flats. I told Sean that he should consider entering the Americas Cup next go 'round. 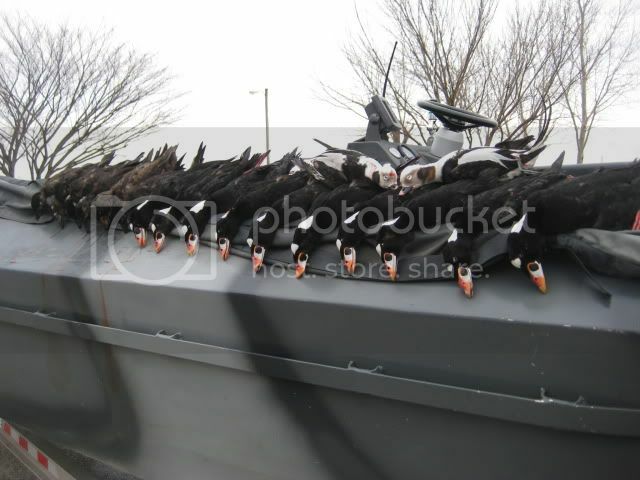 We didn't shoot single duck, but saw some cans and bluebills. Some would call it a bad day, but not me. It beat sitting at home. It beat deer hunting. And we learned some things. That's a good day. Way to go Scott on the bling! Glad ya'll had a good time the other day. It was a fun hunt. No more "Can Virgin". I was wondering if that was you. You shoulda seen us Saturday AM. That was interesting. Did you get the router going OK? Swamps and farm ponds are freezing up now, but the main channels are open and the water is high, flooding creek bottoms and timber. A nice little mixed bag from this morning at the edge of the ice. Way to go on the hen hollywood, maybe those pinners will show back up. Yeah, I was thinking about hunting that new hotspot near the islands. We dropped off our two cans at the taxidermist's place this evening. Sean is getting a flying mount. Mine will be standing, similar to this. Here's the pic you sent me this AM. I'm really beginning to get some blind envy here!